I hate to say this, but i think you're over your head on this one. We're talking about stuff that was produced in the early 90's, maybe even earlier. This is very unsophisticated hardware and lacks amenities like 'flash' ram, sram, or anything you could utilize to rewrite it's 'program'. We are most likely talking about a custom 8 bit processor ( if it even is a processor ) that very few people know how to work with. I'm not saying it can't be done, i'm just saying it's not like a z80, 6502, or 8088, all which are well documented and have compilers readily available for. You would basically be looking at writing machine code by hand, or assembly ( if you're lucky ). Your other challenge would be intercepting and decoding the input and output data to the sensors. As far as replacing the obc's 'processor', you'd be hard pressed to find a replacement that you could program. something more sophisticated would require more voltage and more space on the circuit board. easiest would be to figure out how to decode the sensor inputs and make your own OBC from scratch, maybe modifying the OBC's faceplate to fit in a bigger screen and such. again i'm not saying it can't be done, i'm just saying the odds are heavily stacked against you and the result is not worth all of the effort. Use an original OBC screen and just put your own programming and buttons in there. Do you think you could do this with an OBC that is not 18 buttons too? I have the 11 button which is not the smallest but it's not the biggest. My current plan is to take a working OBC and keep only the display and buttons, and use one of the larger PIC microcontrollers to run my custom firmware, written in C, to drive the display and process inputs. I'll be producing my own PC board using my own components. The larger PIC chips have plenty of I/O and A/D to process any of the signals I need. The only other external IC I might need is a display driver to handle the constant refreshing of the display. Most of the sensor inputs are well documented (like the external temp sensor which is just a thermistor) and probably the most difficult 'interface' task will be to figure out the wiring harness and what leads go where in the vehicle. Fuel = Not sure on this one. Is there a fuel consumption sensor that monitors fuel flow, or does the DME report injector timing data that can be converted into fuel usage? Chime = Connects to the chime module located in the driver's knee bolster panel. Check = Connects to the "Check Control" module in the vehicle. Unsure of bus used for data transfer. Again, this is just a pet project and it may indeed go nowhere, but I'd like to give it a try! You will need something to drive the display. that may be the hard part. I'm hoping I can re-use whatever driver IC is in the OBC... Either that or I'll use one of those time-tested Hitachi controller ICS (HD47740?) 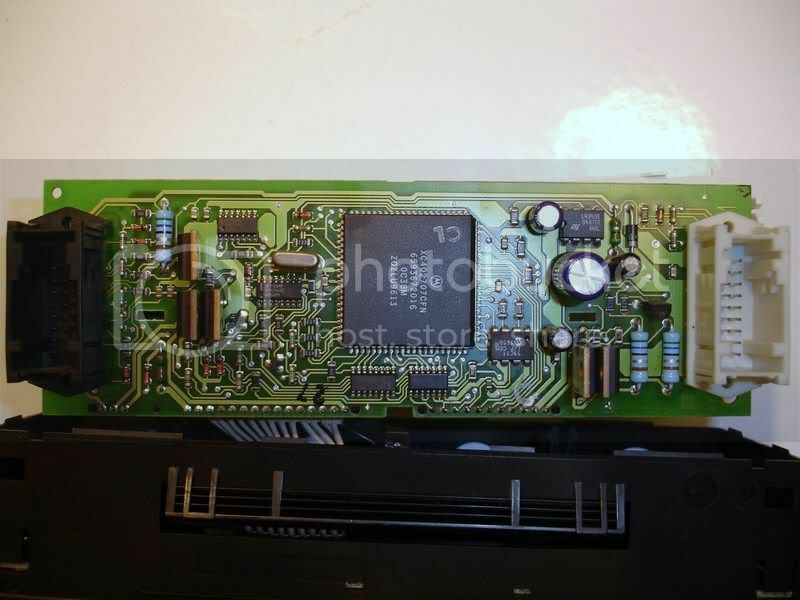 that are in the dot matrix/character LCD panels you can buy for cheap. UPDATE: I picked up a used (working) OBC to experiment with. I took it apart and found there is a separate display driver board and logic board. This is very good news as I can probably keep the display driver board and it will take care of the display part. However, the display driver ICs (2 of them) are obsolete parts from the mid 1990's and the datasheets are no longer available. 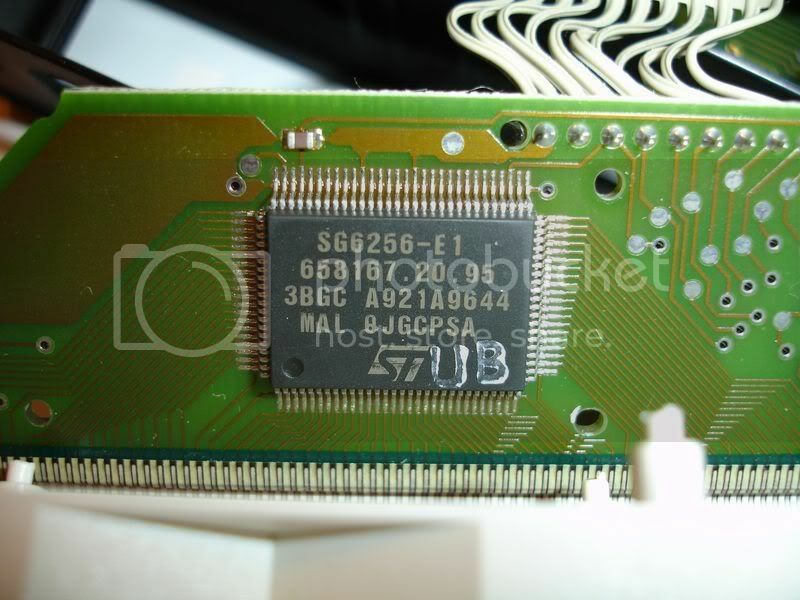 The manufacturer is ST Microelectronics, P/N is SG6256-E1. I even called ST and they couldn't look it up! It looks like I will need to trace the pins from the display back to the logic board and try to make sense of which are data and power. More updates to follow! Not sure if this will help at all, but I found two links to references of the SG6256-E1. If that is no help, sorry. I submitted those forms -- let's see if I get SPAM or if they can send me the PDF datasheet! I am looking in some older Digi-Key catalogs, and a few other industrial supply catalogs that have a lot of IC's and chip components, maybe I can find a data sheet in them. I found an overseas distributor if you care to check them out. Also, if that chip is too hard to find, there might be a possible alternative here. Last edited by fPortal; 01-21-2009 at 02:05 AM. Here's some closeups of the various parts inside the OBC. I have a spare laying around, but the display is garbled. 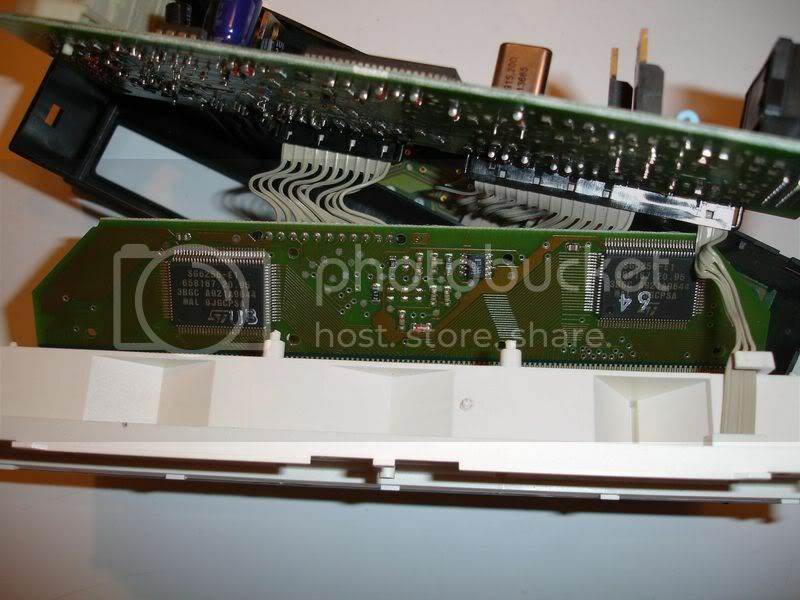 Do you mind cracking it open and seeing what chips are used for the "display" board? There may be different numbers on yours that might be an equivalent device. Not at all. Let me go get it out of the garage and pull it apart. Ok, dismantled. It seems the 11 Button OBC is a bit different. It does not have the separate boards. Sorry for the quality, bad lighting in here. Should have used flash. Also I should have resized. It would be great if you could make the otherwise useless OBC into something useful. Please make this happen. I wish you the best of luck. I wish I had some programming experience to help you as it would be a cool project to be a part of! Hmm, do you see any chips with lots of pins like my "display controller IC" photo above? I want to see the P/N and what some of the connections look like. Can you get a closeup of that chip with better lighting? Sure, no prob, I need to de-solder the light holder so I can get to the display controller IC's. I will get that done today, I need to unpack my soldering iron. so are e36s the newer I bus system or the older bus as used on e32/e34? looks like probably the same bus as the e34. if e34 type, all the hard work in decoding the text output on the data line and encoding other text to appear as Check control text in the display is already done. much more useful than the 4 character obc. though i fail to understand what is wrong with the 20+ parameters that the OBC can already display natively. nor why someone wouldn;t just unlock their obc and program einheit manually either. 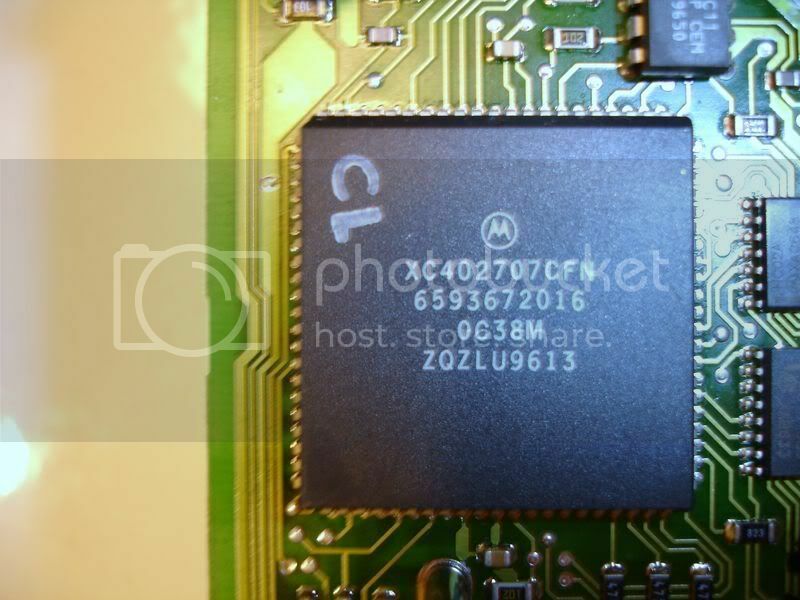 (tip: it is hardware, not software-- e46 are software). Last edited by attack eagle; 01-21-2009 at 09:35 PM. so are e36s the newer I bus system or the older e34 bus? looks like the same as the e34. if e34 type, all the hard work in decoding the text output on the data line and encoding the Check control text in the display is already done. My problem with the unit numbers (Einheit) is that I cannot find the two that are needed to allow me to use the Check Control, and BMW wants to charge me $100 an hour labor to correct it. 1 make sure you have the correct OBC for your year of car, as there was an updated one from what I read in the last 10 minutes. you wouldn;t want to mix n match a new car with an old obc nor vice versa. 2 ask someone with the same market, model, enginetype and transmission etc to give you the code (actually unit ID) theirs uses. input. works. 3: pay bmw the 100 bucks. 4 find dealer that will do it for less, or a tech willing to do it on the side. If not think you need a working OBC. Last edited by attack eagle; 01-21-2009 at 09:42 PM. I would bet that the first IDs the inputs and ranges for inputs (ie car type) and the second tank size. that is usually what has to be corrected on e34s using e32 obcs. These cars had different tank sizes? you tried the standard b3 and FF and nothing works? Are you sure it is a good obc (seen it work in another car)? have you seen another OBC work there in yours? Stolen stereo (or DIY aftermarket) often = torn up wires. It isn't a damn vin number interrogator or something. Just an OBC configuration code. Last edited by attack eagle; 01-21-2009 at 09:53 PM. hehe. Yea, it was working before the old OBC Display died on me, then I picked up this 18 button one and installed it. It was working before it was pulled from the other 325i. I guess I am going to just have to sit with a paper and pen, and just play with the numbers.